When you need a clothesline, just pull line out and attach it to included hook. When your clothes are dry and removed, let the line go back in so it stays out of the way. Line extends to almost 50 ft. attaches to vertical surfaces with included hardware. Saves space, swivels flat against wall when not in use. For indoor or outdoor use. Rust resistant plastic housing. Note: Included wall plugs for mounting are for brick walls only. I should have saved my money and just used two hooks. Does not work well retracting. I probably expected too much. Lehman's says: We're so sorry for your experience. Please give us a call, so we can make it right.1-800-438-5346. With lots of homesteading going on in my backyard, this is my favorite new addition. With no permanent clothesline set up, I don't have to compromise any of my limited space. This works wonderfully, even at the full 50 feet. The inventor of this clothesline is absolutely brilliant! This item worked okay for awhile (over a year), although when extended the full length, it sagged badly--but when it breaks (the spring inside), it is completely done. No way to get inside and replace a part, nothing to do but put it in the recycling bin and hope they can melt it down. Very unhappy with an item that is unrepairable. Less than a year old and it has already broken. Had a full load on it and the line snapped. I should mention that I don't think the photo shows the correct usage of this line. After hooking the line, I wrap part of the slack of the cord tight around that little spool (hanging upside down on the piece that is nailed to the fence in the photo). This keeps the line/clothes from sagging. Ours is located in the backyard attached to a hook on the back of the house traveling 50 feet to the L shaped back of my house, giving me a protected sunny location to hang my laundry. The line is strong enough to hold clothing, towels, men's trousers and bed sheets. My grandfather had one and I have been looking for this items for a long time. Lehman's always has unique items for the home and so well made. I wish there was more line than 50 feet as I enjoy doing what my grandparents did in hanging out the laundry. The clothes smell so fresh. Thank you Lehmans for offering well made items of yesteryears. This clothesline has a space on my porch during the summer and in a spare bedroom in the winter. No need to worry about rain while drying laundry and in the winter the laundry adds much needed moisture in the house. Simple to use and then retract away. Great clotheslines. I used to have to deal with constantly taking my clothesline down to accommodate farm wagons coming through, or pushing it up to let horses go under. Now, with this line, when I take my clothes down I simply let it retract and it is out of the way. I use two of these lines to hold a couple loads of wash at a time. The lines do not sag, even with heavy clothing. I've used them going on 2 years, and they work as well now as the day they were (easily) installed. 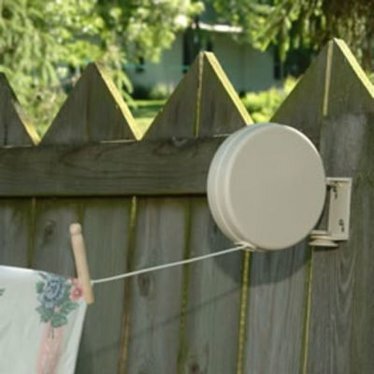 The retractable clothesline is absolutely perfect! I can't believe I hesitated before purchasing it. The entire transaction has been a pleasure. What a great invention this is! I can't remember the last time I spent $20 bucks and felt so good about it! Very tidy and functional. This line lasted one summer, my husband repaired it and this summer with less than 40 lbs on wash on it, the plastic case broke a second time. I would not order this again as, basically, I bought a vinyl clothes line that can only be used full length. We can make do, but are dissappointed, very, in the product. My husband and I were so happy with this clothesline! We have decided to purchase another! It is so easy to use. He liked the easy installation! When the weather turns too cold to hang your clothes, you can bring the device in doors. Thanks Lehman's for carrying such a great product! Overall, I really enjoy using this clothesline. I live in an apartment in Queens, NY where the retractable line is super-convenient and discreet. My friends who visit are impressed and a bit envious! The one negative aspect is that the line itself usually sags considerably under the weight of the clothes. If what I'm hanging is long (such as pants or a blanket), I expect it to touch the floor, which is diappointing. (By the way, I have the round base itself screwed in at about 8 feet above the floor.) There are times when I'm tempted to buy a wooden floor clothes dryer to supplement this one. I was attracted to this item because of ease of use on my porch and the total length is great. I saw a similar item at a national hardware retailer which was a few dollars less, but it only claimed to hold 22 lbs, while this one claims 200 lbs. The strength is in the locking mechanism on the device. I am hoping the vinyl covered wire does not split, though. I particularly like that is was made in the USA which implies better workmanship to me. I am very happy with it. Note the picture because directions do not come with the item and I see I mounted it incorrectly. Purchased as gift for my wife. She loved it so much I had to buy another one for our vacation place. I Love this!! It works perfect in the spot I needed to put it - attached to my fence and the side of my house. It's so easy to retract when I'm finished, since I live in a suburban subdivision with covenants. Nobody can see it from the street, and it's so efficient!! Thanks so much for a great product!! I have a tiny yard so I didn't want a large amount of space taken up by a permanent clothesline. This item is the perfect solution! I purchased 2 lines and I couldn't be happier. There were many other retractable clotheslines available online, but Lehman's is a name I knew I could trust. Just what I have been searching for, use indoors in winter for drying cloths, while adding the humidity that is needed with wood heat. Like this very much and will recommend to friends who also heat with wood. I have used this clothes line for 3 years now and it is wonderful. I am ordering another to have more room to hang out my clothes. It has stayed like new. Everyone need one. I have been looking for these for a few years to replace the ones I have. I have tried other brands, but this is the BEST!Great quality! Lehman's service is also the best!